Before the bombast of such classics as "Smoke On The Water" or "Highway Star," there was Deep Purple Mk. I. The original band released three albums between 1968 and 1969 and featured Rod Evans on vocals and Nick Simper on bass. This incarnation was more psychedelic and pop-oriented than the hard rock sound the band would come to be known for. Now, all three of these albums are being rereleased with bonus tracks. 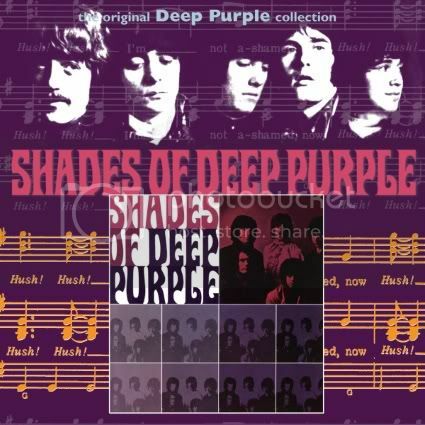 Deep Purple's first album, Shades Of Deep Purple, had a fair amount of success — particularly in the U.S. — including a top-5 hit with their cover of the Joe South-written "Hush." The song remains a staple of classic rock radio to this day and is the best-known version of the song. The band thought highly enough of it to rerecord it with Mk. II singer, Ian Gillan, for an album celebrating their 20th anniversary. The album opens with the instrumental, "And The Address," which begins with some heavy, psychedelic organ playing from Jon Lord before launching into an up-tempo blues-based jam that wouldn't seem out of place on a Jimi Hendrix record. Even at this early stage, the band was extremely tight and it shows with this track. In a further nod to Hendrix, the band covers "Hey Joe," reworking the song considerably with an extended organ intro and some Bolero-influenced jamming before settling into the song's familiar groove. Similarly, their version of "I'm So Glad" includes a lengthy, classically influenced intro and their cover of "Help!" slows the pace considerably, lengthening the song to six minutes and emphasizing the despair of the lyrics. The band was light on original material at this point and possibly still feeling out their direction, yet their covers often take the songs in interesting, new directions. Of the originals, "One More Rainy Day" sounds of the period as a typical late-60s ballad. The track is pleasant, but dated. More interesting is "Mandrake Root," another Hendrix-inspired, largely instrumental track that is one of the few Mk.1 songs performed live by the band after Evans' and Simper's departure. The CD features five bonus tracks, including an instrumental version of "Love Help Me," an alternate version of "Help!" and an exciting live take of "Hush" from a U.S. television appearance. Shades Of Deep Purple shows a band that hasn't yet figured out exactly what it wants to sound like. Deep Purple would, of course, eventually take a harder-edged route, with Ritchie Blackmore cementing his place among the guitar greats, but there's something to be said for being able to also pull off the pop and psychedelic sounds of their debut, making Shades Of Deep Purple an interesting listen.